Pandemonium broke out at the ongoing campaign rally of the ruling All Progressives Congress (APC) in Abeokuta. The campaign took a new twist when Ogun state governor, Ibikunle Amosun, came on stage to campaign for the APC and the Allied Peoples Movement (APM). In response, former governor Aregbesola came on stage to oppose the governor, asking the people to vote for only the candidates of the ruling All Progressives Congress. 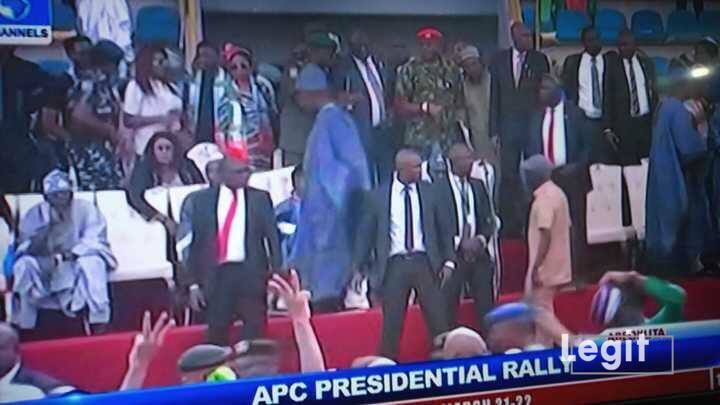 After Aregbesola started speaking, supporters of the APM verbally opposed him and it degenerated into a rowdy session when Adams Oshiomhole, the APC national chairman came on stage. Supporters took laws into their hands and started throwing things at the APC leaders. Recall that Legit.ng had reported that clashed in Ogun state on Monday, February 11, ahead of President Muhammadu Buhari’s visit to the state. The clash occurred between supporters of Governor Amosun and those of the APC governorship candidate in Ogun state, Prince . The clash reportedly occurred at the MKO Abiola International Stadium, Abeokuta, venue of the presidential campaign rally. The fracas was said to have started when loyalists of the Allied People’s Movement (APM) gubernatorial candidate, Adekunle Akinlade, were desperate to outshine one another. Amosun, who is opposed to the candidature of Abiodun, is backing Akinlade as his anointed governorship candidate. Several people were said to have suffered various degree of injuries as a result of the clash.